Martini, usually called Tini, is the third child of seven. She used to live in a small house with her mother and six siblings. Her father already passed away. Her mother works in a cacao plantation and doesn’t earn enough to support her family or send all of her children to school. Tini used to help her mother around the house, causing her to miss a lot of her classes and having to repeat a year. 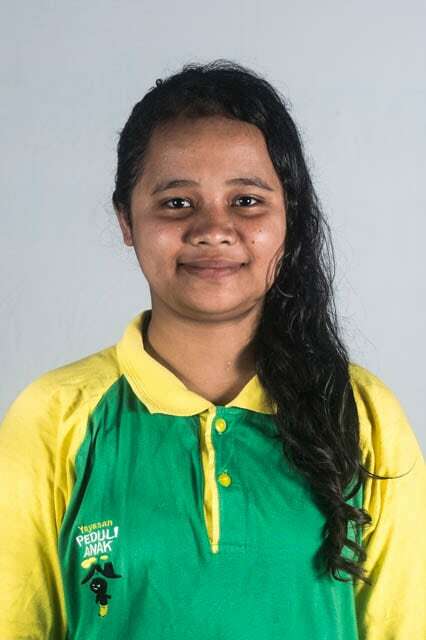 Because of that, she was referred to Peduli Anak so she would be able to continue her study without interruption. Tini is a shy girl who doesn’t talk a lot, but she always looks happy when she’s playing with her friends. She really enjoys going to school again.